1 How to help us promote WikiSym 2008? 1.1 How to tag WikiSym conference? 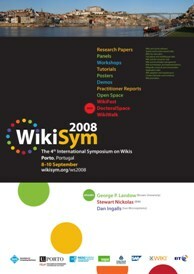 How to help us promote WikiSym 2008? 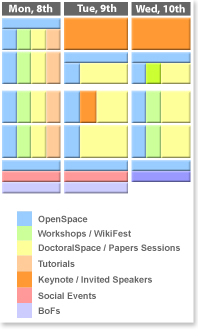 How to tag WikiSym conference? When tagging articles, posts, photos, or any other material about WikiSym, we recommend you to use the tag wikisym. A flyer with the "Call for Papers" is available here. Please print and distribute it to those that might be interested on WikiSym! An ASCII text file with the "Call for Papers" is available here. Take a look at the official photos of WikiSym2008. You have photos of your own? Add yours to the pile!. Are you in the mosaic? Show us who you are. Put your photo on the participants mosaic. This page was last modified 14:00, 27 August 2008.